In 1965 the Idlewild Management Company decided to resurrect the zoo concept that had faded away during the World War II years. 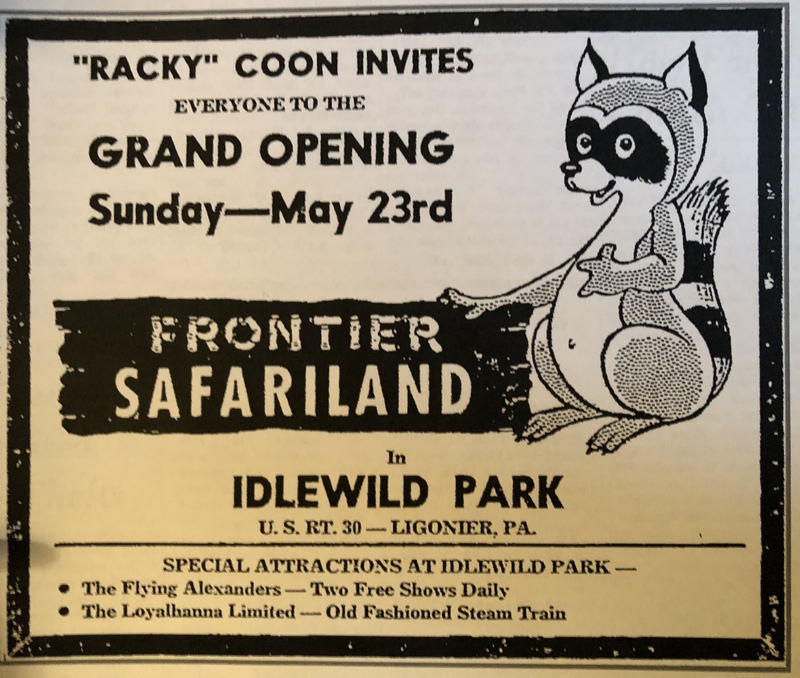 Featuring a collection of North American wild animals and a domestic petting zoo, Frontier Safariland debuted to the public on May 23, 1965 at the start of Idlewild Park’s new season. It was built on the south side of the Loyalhanna Creek within the former Woodlands area, surrounded by surviving vestiges of old Lake Woodland. Renamed Safariland Zoo and then Frontier Zoo, the concession enjoyed a successful 20-year run at Idlewild before it was closed after the 1985 season. The park opened the New Zoo Review the next year, a more “participatory” zoo area that only lasted for a few seasons before closing down to make room for the Raccoon Lagoon kiddieland area in 1990. The zoo featured a wide variety of animals that were cared for by an concessionaire, most notably William Holmberg of Ligonier, who took over Frontier Zoo in 1968 and managed the attraction until it closed. At its inception, the zoo’s more exotic animals included California sea lions, a llama, an armadillo, peafowl and flamingos, among others. Visitors could feed whitetail and ornamental deer in a petting area. The zoo also included a monkey house. Holmberg added other unique species like camels and miniature donkeys during his tenure. Alan Fisher, who portrayed park mascot Captain Idlewild in 1980, recalled he was not a fan of the zoo because of the misbehaving animals, a spider monkey in particular. I’ll spare readers the details, but if you’ve visited a zoo and watched how these animals behave, you know what I’m hinting at. But the most interesting – well, morbid – story I read in relation to the zoo took place about five years after it closed. In January 1990, William Holmberg sold two chimpanzees – an 18-year old female named Missy and a 20-year old male named Boom Boom (or just Boom) to The New York University Medical Center’s Laboratory for Experimental Medicine and Surgery in Primates to be used for breeding. Holmberg had raised the two chimpanzees from babies and housed them in former car dealership building on Route 711 just north of Ligonier after Frontier Zoo closed while he searched for a new home where they would not be used for research. Dr. John Kelliher, a veterinarian or the U.S. Food and Drug Adminstration, was hired to transport the primates from Ligonier to the laboratory. While he was being transferred from his home cage to a transport cage around 2:15 a.m. on January 15, 1990, Boom escaped and attacked Kelliher, severely disfiguring the vet, tearing off two fingers, a thumb and one ear. Holmberg shoved Kelliher into a cage to protect him from being mauled any further. The truck driver who accompanied Kelliher alerted the police. After four ineffective gunshots from Holmberg, a state trooper finally killed Boom Boom. Idlewild never had any trouble with either chimpanzee, and Holmberg had treated them well while they lived at the park and at his home. So why the sudden attack? Police believed that the vet might have been carrying the scent of another male chimpanzee, which threatened Boom Boom.